Dimensions (HxWxD): 3.5" x 3.5" x 3.5"
Angelite is also said to establish a bubble of protective energy around the bearer. Crystal healers also use Angelite to aid in the re-birthing process. 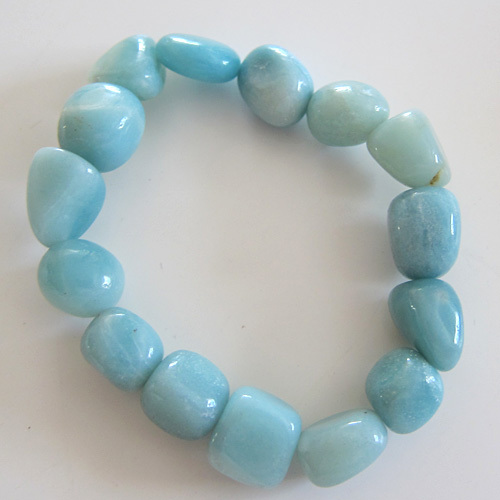 The blue color of Angelite suggests that this stone would be helpful in relieving inflammation of all types and in soothing mind, body and an aching heart. Individuals can use angelite to help them speak their own truth, and to bring into consciousness all kinds of early childhood and past life issues that inhibit communication with others. Angelite would be very helpful to all people involved in mass communications, and any projects involved in film, video, publishing, music, or Internet. Above weight is shipping weight, average weight is 44 grams. Please note each bracelet may differ very slightly in appearance from the photo here, as each piece is made from natural crystal beads, so may have slight variations. Each piece is guaranteed to be beautiful & to meet with your complete satisfaction!